Perfect for CEOs, CFOs, Human Resource/Corporate Affairs executives, but also for government and not-for-profit leaders, this book helps you come up with a solid plan for giving back to society, producing real sustainable value. 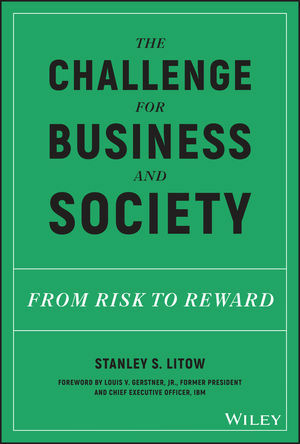 STANLEY S. LITOW is a global thought leader on critical policy issues including education, jobs, and the economy. He has had a lengthy high-level career in business, government, education, and civil society. Serving under three CEOs, he led IBM's corporate citizenship programs and the IBM Foundation, where he created some of the world's most innovative corporate social responsibility efforts. At IBM he organized and helped lead three National Education Summits for the U.S. president, the nation's governors, CEOs, and education leaders. Before his IBM career he served as deputy chancellor of schools for the City of New York where he pioneered significant education reforms. He also founded and led a major think tank, Interface, that helped the City of New York cope with its last fiscal crisis. Prior to that he served under the mayor of New York City as executive director of the New York City Urban Corps, the nation's largest college intern program, and served on a range of advisory panels for the president of the United States and the governor of New York, where he chairs the State University of New York's Academic Affairs Committee.